​Why should you take this course? 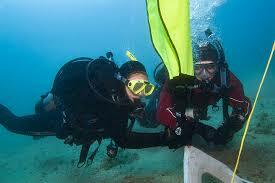 It happens....People accidentally drop things off docks, boats and even while scuba diving. If you have ever lost something underwater and wanted to go and find it then the PADI Search & Recovery Diver Specialty course is for you. There are effective ways to search for things underwater that increase your chances of success. ​The first dive of this PADI Specialty Diver course may credit as an Adventure Dive toward your Advanced Open Water Diver certification – ask your instructor about earning credit.